"Dark energy is one of the great scientific mysteries of our time, so it isn't surprising that so many researchers question its existence. But now, according to a team of astronomers at the University of Portsmouth and LMU University Munich, led by Tommaso Giannantonio and Robert Crittenden, the scientists the likelihood of the existence of dark matter stands at 99.996 per cent. "But with our new work we're more confident than ever that this exotic component of the Universe is real – even if we still have no idea what it consists of," said Bob Nichol, a member of the Portsmouth team. Over a decade ago, astronomers observing the brightness of distant supernovae realised that the expansion of the Universe appeared to be accelerating. The acceleration is attributed to the repulsive force associated with dark energy now thought to make up 73 per cent of the content of the cosmos. The researchers who made this discovery received the Nobel Prize for Physics in 2011, but the existence of dark energy remains a topic of hot debate. 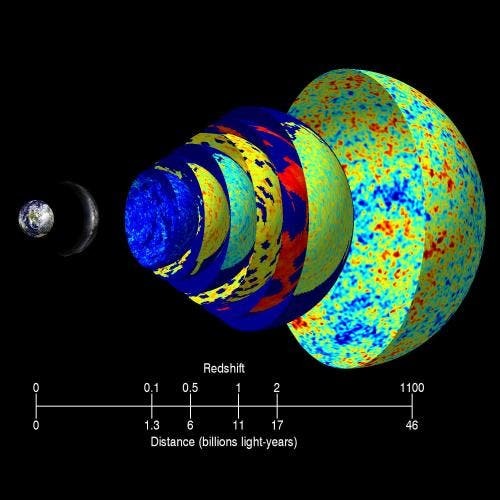 Many other techniques have been used to confirm the reality of dark energy but they are either indirect probes of the accelerating Universe or susceptible to their own uncertainties. Clear evidence for dark energy comes from the Integrated Sachs Wolfe effect named after Rainer Sachs and Arthur Wolfe. The Cosmic Microwave Background, the radiation of the residual heat of the Big Bang, is seen all over the sky. In 1967 Sachs and Wolfe proposed that light from this radiation would become slightly bluer as it passed through the gravitational fields of lumps of matter, an effect known as gravitational redshift. In 1996, Robert Crittenden and Neil Turok, now at the Perimeter Institute in Canada, took this idea to the next level, suggesting that astronomers could look for these small changes in the energy of the light, or photons, by comparing the temperature of the radiation with maps of galaxies in the local Universe. In the absence of dark energy, or a large curvature in the Universe, there would be no correspondence between these two maps (the distant cosmic microwave background and relatively closer distribution of galaxies), but the existence of dark energy would lead to the strange, counter-intuitive effect where the cosmic microwave background photons would gain energy as they travelled through large lumps of mass. The Integrated Sachs Wolfe effect was first detected in 2003 and was immediately seen as corroborative evidence for dark energy, featuring in the 'Discovery of the year' in Science magazine. But the signal is weak as the expected correlation between maps is small and so some scientists suggested it was caused by other sources such as the dust in our galaxy. Since the first Integrated Sachs Wolfe papers, several astronomers have questioned the original detections of the effect and thus called some of the strongest evidence yet for dark energy into question. In the new paper, the product of nearly two years of work, the team have re-examined all the arguments against the Integrated Sachs Wolfe detection as well as improving the maps used in the original work. In their painstaking analysis, they conclude that there is a 99.996 per cent chance that dark energy is responsible for the hotter parts of the cosmic microwave background maps (or the same level of significance as the recent discovery of the Higgs boson). "This work also tells us about possible modifications to Einstein's theory of General Relativity", notes Tommaso Giannantonio, lead author of the present study. "The next generation of cosmic microwave background and galaxy surveys should provide the definitive measurement, either confirming general relativity, including dark energy, or even more intriguingly, demanding a completely new understanding of how gravity works." For more information: The new work appears in "The significance of the integrated Sachs-Wolfe effect revisited", T. Ginnantonio, R. Crittenden, R. Nichol, A. Ross, Monthly Notices of the Royal Astronomical Society, in press. A preprint of the paper is available from arxiv.org/abs/1209.2125 Journal reference: Monthly Notices of the Royal Astronomical Society. Berkeley Lab scientists are the leaders of BOSS, the Baryon Oscillation Spectroscopic Survey. They and their colleagues in the third Sloan Digital Sky Survey have developed the most precise measurements ever made of the era when dark energy turned on. The image belwo is a visual impression of the data used in the study. The relevant extra-galactic maps are represented as shells of increasing distance from Earth from left to right. The closest thing seen is our Milky Way galaxy, which is a potential source of noise for the analysis. After this are six shells containing maps of the millions of distant galaxies used in the study. These maps are produced using different telescopes in different wavelengths and are colour-coded to show denser clumps of galaxies as red and under-dense regions as blue. There are holes in the maps due to data quality cuts. The last, largest shell shows the temperature of the cosmic microwave background from the WMAP satellite (red is hot, blue is cold), which is the most distant image of the Universe seen, some 46 billion light-years away. 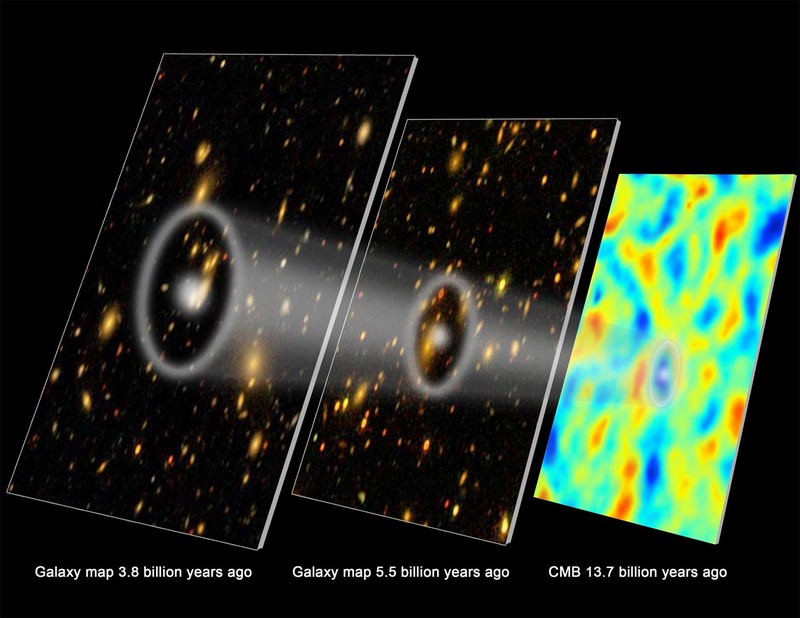 The team have detected (at 99.996% significance) very small correlations between these foreground maps (on the left) and the cosmic microwave background (on the right). Image credits: Earth: NASA/BlueEarth; Milky Way: ESO/S. Brunier; CMB: NASA/WMAP.